Hello again dear reader, hope all is good in your world. The weather of late has been rather turbulent with another rendition of the great flood of 1953 being the main feature in the news. Yet come the Saturday two days later, the weather was a mild 10ºC and sunny, ideal for the volunteer work party at Purdis Heath with 19 volunteers turning out to help clear and cut back the gorse to allow the area to scraped which in turn will allow fresh heather to shoot up and provide an ideal habitat for the Silver-studded blue (Plebejus argus) to breed in. The cut gorse piled high on a sheet before being dragged away. As we lopped away at the gorse, we transferred it to a large sheet or some big tonne bags as used by ballast companies for supplying tonnes of sand and ballast to the building trade. We moved it like this so as not to unintentionally spread the seeds of the gorse over a bigger area, which would be defeating the purpose for which we were there. It was a lovely day with a great bunch of people and many of the photos can be seen on the Purdis Heath SSSI Facebook page. The great thing about these volunteer work parties is that it just isn't about work, you get to learn and observe things at the same time. For instance, whilst we were chopping away at the gorse, a volunteer (Val) noticed that a couple of the tall gorse bushes were looking rather trim and proper unlike all the other scraggly gorse bushes around. Neatly pruned on the left, naturally scraggy on the right. We came to the conclusion that these gorse had been grazed upon by deer and as the bushes were around 8 feet high, the only likely culprit would be the Red Deer (Cervus elaphus) as these are big deer and quite capable of reaching such a height. A better view of the nibbled gorse. I remember last year whilst driving down the A14 in my truck and seeing the antlers of a stag and some of his hinds walking in a field just over a mile from the site at Purdis. 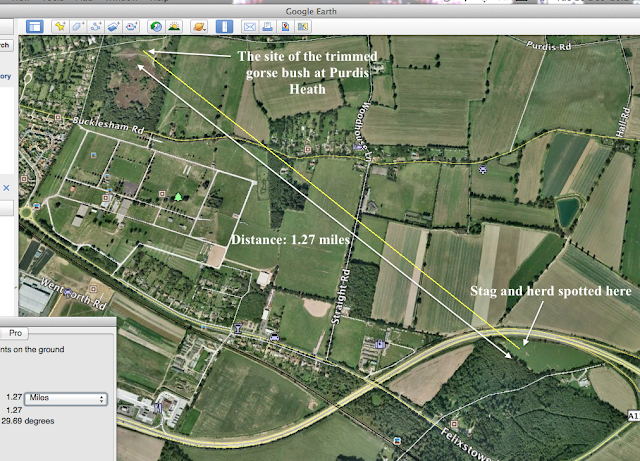 A Google Earth aerial view of the landscape between the two sites. As we can see from the above image from Google Earth, there are no populated areas between the Purdis Heath and the sighting of the herd last year. Another thing that sticks out (to me anyway) is the lack of natural habitation between the two sites. There is nothing except arable fields which have very little wildlife value. When I spotted the deer a year ago, it was early in the morning just before first light, so it is possible that the deer use the heathland at Purdis occasionally to feed before heading to the woodland at Seven Hills (where I spotted them) to rest in the security and shade of the woodland for the day. This is just another reason why sites like this need to exist to preserve our natural world. Another thing that I came across was this little old nest that had seen little use during the year. At first glance it looked like a small bird nest, but on closer inspection, it had seed heads from some broom that had been growing nearby which would suggest rodent such as a field mouse, harvest mouse etc. Several of the naturalists among us had a good look and think about it and the eventual consensus was that it was probably built by a bird before being taken over by a rodent. During the tea breaks where tea, coffee, biscuits, mince pies and some lovely cakes supplied by Susanne were consumed, we got to talking all things nature and was told by Julian and Helen that only last week a Peregrine Falcon (Falco peregrinus) was spotted flushing wood pigeons on the heath. Also whilst we chatted, a Peacock butterfly (Inachis io) was also seen to fly by so sunny and mild it was. During the lopping of the gorse, I came across two 7-spot ladybirds (Coccinella 7-punctata) which I recorded using my iPhone app. So nice to see some natives instead of dreaded Harlequins (Harmonia axyridis). So if you fancy coming along to the next work party, then please do. It's on Saturday January 4th 2014, an ideal time to work off the excesses of Xmas. We meet up in Bucklesahm Rd at 10am and work unto 3pm, but you can come and go as you please, after all, you are a volunteer. Please bring along a packed lunch and some suitable clothing. If the weather is pouring down, it will be likely to be called off, so watch this space and we will have a better idea nearer the date. As many of you know, I won a category of the Suffolk Wildlife Trust's photo competition and this week I received my prize in the post. What did I win? I hear you shout in anticipation. I got a certificate, a print of my image and a years membership to SWT which is worth £30, excellent! Included in the membership pack along with a car sticker, a copy of SWT's magazine and some information on the work they do, there is also the wonderful book, Suffolk Landscapes, which has some wonderful photos of the nature reserves within Suffolk and some text about them as well. Keeping with the SWT theme, last week I left you in suspense that I might have some exciting news to share with you and now I can for the day after getting my prize in the post, I had to pop down to their HQ in Ashbocking to discuss a wonderful volunteer opportunity that had arisen within the trust of Education and Events volunteer. I went today and had a wonderful chat with them and am going on the volunteer induction day in the new year, I got the job! I'm well chuffed to say the least and will keep you posted on any developments. The new job will see me travelling around the county helping out with displays, nature trails and events and helping to educate children and adults alike about the wonders of nature, helping with bioblitz's and much more. It's something I am very much looking forward to and cannot wait to get started. That's it for now, so till next time dear reader, please take care. Fantastic work Hawk. It's a great blog telling of what's going on in the area. Congrats on the deserved SWT prize too!